(VOV) - The National Steering Committee for Flood and Storm Prevention’s September 7 report puts the death toll from recent heavy rain, floods, and landslides in northern provinces at 25. Lao Cai’s 10 fatalities make it the heaviest hit, followed by Thai Nguyen, Lai Chau, and Vinh Phuc with three deaths each; Lang Son and Dien Bien with two; and Ha Giang and Son La with one. The floods injured and additional 16 people, destroyed 139 houses, and inundated over 6,800 hectares of rice and other crops. Total financial losses caused by the disaster are estimated at about VND39.2 billion. Local authorities have begun clearing roads blocked by water and debris. The National Centre for Hydrometeorological Forecasting warns water levels are still rising dangerously in a number of northern provincial rivers, but is optimistic the flooding will ebb slightly over September 8. 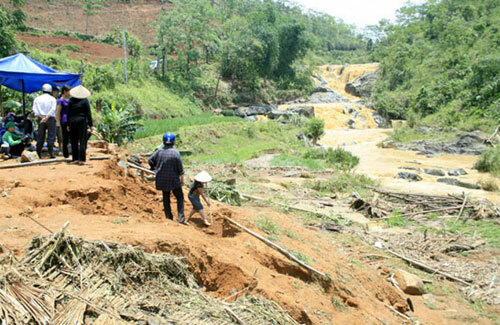 The centre also issued flood and landslide warnings for the northeastern localities of Quang Ninh, Lang Son, Cao Bang, Bac Can, Thai Nguyen, and Phu Tho.